I did one and three by myself and got help with number two. Here are the details. Rory gave me the vector entered =LOOKUP(1E+100,1/C5:AAA5,C5:AAA5) … enter the formula in cell B5 and drag it down to the end of the list. Note: Rory’s formula will allow us to add new columns to the end of this table up to column AAA whereas Laurent’s formula has to stop at the end of the table as it is at the time you program it. I have, however, not shown here, changed the table of prices to an Excel Table in an attempt to get Laurent’s formula to update automatically as new prices are added but so far without success! I often talk about the communication of data and information in the context of any work we might do when using Excel. This third project was presented as a before and after scenario. The company which employs the delegate in question has changed its holiday pay arrangements and he wanted to know if he was better or worse off under the changes. The worksheet I was given turned out to be as accurate as I could have made it but, in my opinion, it was a bit of a headache to use. As I accepted the challenge I told my delegate that it might be that all I do is suggest a different layout. Here are the before and after with the before being difficult to show here in a truly sensible way, showing the old system, the new system and the differences between them!! Note: with this new layout, you can see the input section quite clearly and the output section sits right beneath, cascaded to the right. 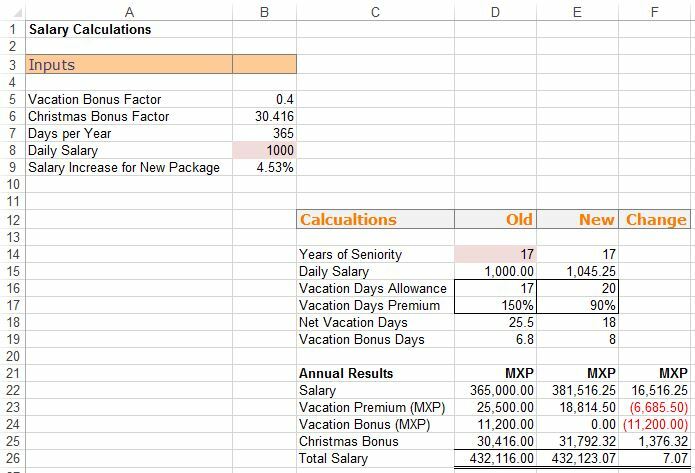 Moreover, all that we need to do to update the input and output here is to enter the daily salary and the years of seniority: the calculation table does the rest. That’s right, change two cells and the programming does the rest! I also added to graphs that I thought would be useful: they are based on the before table and show the two systems side by side: so there can be a use for the large, original table! There you are! I always come back with something and these were three mini projects that I thought you’d like to read about. Because of confidentiality I cannot share the Excel files with you beyond what you see here, sorry! I will leave this one hanging: use conditional formatting to create the icon set solution to the top part of the wrok sheet: trend data and the icon set; and a conditionally formatted chart in which every bar is shown automatically as a different colour … no cheating, program it properly. Then again, how about this very efficient and succinct suggestion?